We’d love your help. Let us know what’s wrong with this preview of Vossoff and Nimmitz by Adam-Troy Castro. ERNST VOSSOFF Ruthless. Maniacal.KARL NIMMITZ Annoying. Incomprehensible. So doglike he sticks his head out car windows to let his ears flap in the wind.Together with the wealthy and glamorous Dejah Shapiro, they encounter alien coffee tables, bunny rabbits the size of planets, and a certain cylindrical space station. Can the universe survive? To ask other readers questions about Vossoff and Nimmitz, please sign up. I read a few of these stories back in the day when they were published in the glossy magazine Science Fiction Age. However, I didn't rate them as highly back then, perhaps due to some confusion as to the characters and their relationships. Sitting down to read this, I wonder why I was confused, as the basic plot premise is pretty easy to understand. It helps that each story is presented in chronological order, so I'm glad that I was finally able to read the sequence without missing any details, a I read a few of these stories back in the day when they were published in the glossy magazine Science Fiction Age. However, I didn't rate them as highly back then, perhaps due to some confusion as to the characters and their relationships. Sitting down to read this, I wonder why I was confused, as the basic plot premise is pretty easy to understand. It helps that each story is presented in chronological order, so I'm glad that I was finally able to read the sequence without missing any details, and this allowed me to really appreciate these stories. The basic setup is thus: Vossoff and Nimmitz are partners, and small-time crooks who ultimately fail in every venture. Nimmitz is the dumber of the two, and Vossoff is the inept mastermind. Each story sees them plotting to gain wealth at the expense of others, and ultimately failing miserably. By the end of each story, they are locked into some type of inescapable situation as punishment. And then the next story begins with some farcical explanation of how they escape and leads into their next vile venture. Along the way, a woman is introduced, and this complicates their relationship. Nimmitz becomes even more dumb, and Vossoff earns the reputation as a super-criminal (despite the fact that he's never been successful at anything), and the two become bitter enemies. Missing a story or two, or reading them in the wrong order would certainly create confusion, but the whole series is very pleasing when you read it as presented in this ebook. And funny - I rarely laugh out loud when I'm reading, but this book caused me to do just that several times! Entertaining, agreeably silly linked stories. "Ernst Vossoff and Karl Nimmitz: How boldly the names of those two hapless thugs and misadventurers resonate throughout the universe, even unto future and past eras!" This is an entertaining collection of linked stories, first published in the late "Science Fiction Age" magazine. They were all new to me, and are agreeably silly. Other readers' reactions to humor are famously unpredictable, but I got quite a few chuckles, reading IDIOTS. The stories wo Entertaining, agreeably silly linked stories. This is an entertaining collection of linked stories, first published in the late "Science Fiction Age" magazine. They were all new to me, and are agreeably silly. Other readers' reactions to humor are famously unpredictable, but I got quite a few chuckles, reading IDIOTS. The stories worked better than I would have expected, really, given their ramshackle construction and comic-book logic. Castro is a Sheckley fan, and it shows. Cautiously recommended to SF humor fans: 3.6 stars, +/-. 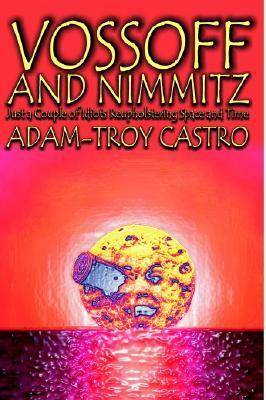 Vossoff and Nimmitz are a couple of supposed criminals bumbling their way around a futuristic universe. They fancy themselves dangerous masterminds, but usually succeed in harming only themselves. This is space age slapstick with lots of goofy dialogue and totally bizarre situations that exceed anything Douglas Adams came up with in the weirdness department. Some of those are really bust-out-laughing hilarious. E.g. our heroes travel to a bland, distant planet populated only by 2 highly advanced Vossoff and Nimmitz are a couple of supposed criminals bumbling their way around a futuristic universe. They fancy themselves dangerous masterminds, but usually succeed in harming only themselves. This is space age slapstick with lots of goofy dialogue and totally bizarre situations that exceed anything Douglas Adams came up with in the weirdness department. Some of those are really bust-out-laughing hilarious. E.g. our heroes travel to a bland, distant planet populated only by 2 highly advanced beings who spend their days sitting on each other. In another story, Vossoff and Nimmitz, hard up for some cash as usual, adopt an extinct alien species for a princely sum - but it turns out to be a pylthothi screaming stink-moss, and by adopting them they adopt their genetic structure and became stink-moss themselves. In another they come across a solar system that is under attack from a giant pink bunny, which turns out to be under the direction of an enormous, hugely powerful alien baby. On planet Gingrich VII, the gravity wavers constantly, making any visitors seasick. And so forth. Wait a minute, half a star you say?? This book was horrible. Took me forever to get through. Hated every second of it.... but couldn't put it down each time I picked it up and laughed out loud many times!! Clever, satirical and ridiculous all at once. Stories follow 2 bumbling Friends, Partners and later Enemies through brilliantly imagined asinine adventures. It may take a while to get through it but it will give you much to ponder and laugh at. I had a subscription to Science Fiction Age and had remembered these stories. It was a nice distraction from the news of the day to read and enjoy these stories. This is an amusing series of connected short stories featuring a couple of blundering space criminals. A light read but very entertaining, humorous science fiction. Adam-Troy Castro made his first professional sale to Spy magazine in 1987. Since then, he's published 12 books and almost 80 short stories. Among those stories are "Baby Girl Diamond" (nominated for the Bram Stoker Award) and "The Funeral March of the Marionettes" (nominated for the Hugo and Nebula Awards in 1998). "The Astronaut from Wyoming," a collaboration with Jerry Oltion, appeared in Analog Adam-Troy Castro made his first professional sale to Spy magazine in 1987. Since then, he's published 12 books and almost 80 short stories. Among those stories are "Baby Girl Diamond" (nominated for the Bram Stoker Award) and "The Funeral March of the Marionettes" (nominated for the Hugo and Nebula Awards in 1998). "The Astronaut from Wyoming," a collaboration with Jerry Oltion, appeared in Analog and was nominated for the Hugo and Nebula Awards in 2000, before winning the Seiun (Japanese Hugo) for best translation in 2008. His "Of A Sweet Slow Dance in the Wake of Temporary Dogs" was nominated for the 2003 Nebula. His original short story collections include Lost in Booth Nine (published by Silver Salamander Press in 1993), An Alien Darkness and A Desperate Decaying Darkness (published by Wildside Press in 2000), Vossoff and Nimmitz (2002), and Tangled Strings (2003). He is also the author of the Spider-Man novels—Time's Arrow: The Present (written in collaboration with Tom DeFalco), The Gathering of the Sinister Six, Revenge of the Sinister Six, and Secret of the Sinister Six—as well as the nonfiction My Ox Is Broken! The Andrea Cort novels include, Emissaries from the Dead, The Third Claw of God, and a third installment currently in progress, tentatively titled The Fall of the Marionettes.